Here's a collection of news related to honey, food, health and nutrition issues from 2013-2014 by Bee Healthy. Watch how natives from a Nepalese tribe hunt in the dangerous mountains for "honey for immortality", a wild honey with natural psychoactive properties (hence also known as the "mad honey") and how they "steal" from the aggressive Giant Himalayan bees, world's biggest bees. Nectar is collected by these bees from the wild flowers of Rhododendrons which contain Grayanotoxins, a poison that can cause death when overdosed. The tribe believes tha the honey is supreme in its medicinal value and contains exceptional health benefits. If you eat honey sourced from Australia and New Zealand, be prepared to pay more as the prices soar. 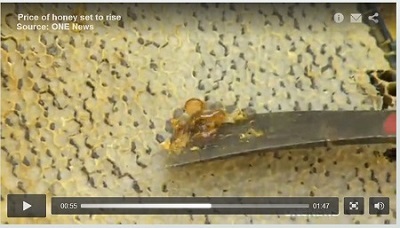 In Australia, beekeepers are facing their worst honey season in ten years. Droughts, bush fires and floods have been cited as reasons for the terrible harvests. 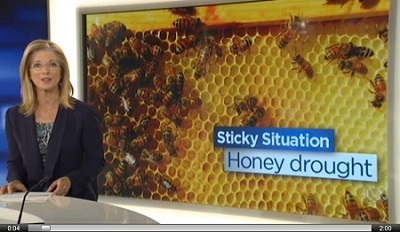 And in New Zealand, honey consumers are also stung by steeper prices. The bees are staying inside their hives due the colder weather and stronger winds. 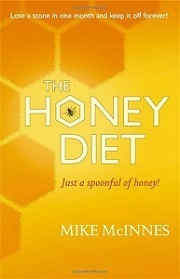 Mike McInnes, the author of the Hibernation Diet, has launched his new book, The Honey Diet. As more and more research points to the link between sleep and metabolic disorders such as obesity, hypertension, and type 2 diabetes and suggests that addressing your sleeping habits may be key for both the prevention and treatment of these disorders, The Honey Diet book will become even more significant in theorising the role of honey during restorative mode. More on how to fed the brain with honey and sleep away the fats in The Honey Diet Book. The propolis bee farm at the Penang Botanical Garden was open to the public since 2009, but it is news to me as we just stumbled upon it and discovered it! And it will be inside my bucket of to-visit-places! 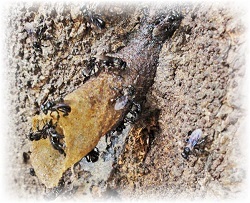 Visitors can learn how the tiny, black stingless bees (Trigona bees) there are bred and how they collect propolis, a resinous mixture known for its potent antibiotic propoerties, from the surrounding botanical plants, as well as how they extract nectar from the garden's floral sources to produce honey. It is said that the bees there produce as much as 500kg of raw medicinal honey every month for commercial purposes. That means visitors can purchase and bring some honey and propolis back from the garden! Ruth Tan published her third book in Amazon - Honey, Are You Real? Too many consumers have fuzzy ideas about honey in different forms and often wonder which honey is more superior (we are not referring to the thousands of different floral varietals worldwide). Other than claiming their honey to be pure, most honey suppliers do not explain very much about their honey. For instance, those who have been eating cream honey tend to question the quality of liquid honey when they see it for the first time, and similarly, those who encounter cream honey for the first time assume it is of a more superior quality than the liquid honey they are familiar with. This book gets to the bottom of the terms used in the honey world - such as raw, pasteurized, creamed, liquid, filtered, pure, crystallization, monofloral, multifloral, etc. It is specially written to help those who are curious about honey and would like to learn how to choose a bottle of honey from the shelves more intelligently. 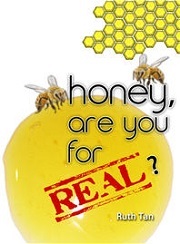 Get more details in: Honey Are You For Real? End of "Honey & Health E-News 2013-2014". Back to "BuzZStop: News!"